The LM317 adjustable positive voltage regulator is capable of supplying in excess of 1.5A over a 1.2V to 37V output range. 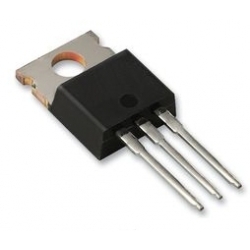 They are exceptionally easy to use and require only two external resistors to set the output voltage. Further, both line and load regulation are better than standard fixed regulators. Beside replacing fixed regulators, the LM317 is useful in a wide variety of other applications. Since the regulator is "floating" and sees only the input to output voltage differential, supplied of several hundred volts can be regulated as long at the maximum input to output voltage differential (of 40V) is not exceeded (i.e. avoid short-circuiting the output). The LM317 offers full overload protection. Included on the chip are current limit and thermal overload protection.